The 2016-17 school year has officially ended. Congratulations to those members who completed classes through Roosevelt’s struggles, and through its restructuring, which should be mostly in place for the 2017-18 school year. The school will be selling buildings, restructuring colleges, and working to stabilize and grow undergraduate, transfer, and graduate enrollments. RAFO can confirm that very early indications seem positive: there has been an increase in enrollment for the summer term, the first at Roosevelt since 2008. And first indications are that there will be an overall increase in enrollments for the Fall, though those numbers will not be firm until the semester opens. But first, summer – and summer will be busy. Next week, RAFO will begin full negotiations with Roosevelt on a new contract. The administration has told RAFO leaders that RU will be relying on adjuncts through the school’s restructuring, and has repeatedly assured us that adjuncts are important and valuable for the future of the school. RAFO intends to make the administration live up to those assurances with a contract that increases adjunct opportunities for stability within Roosevelt, resources to make adjuncts better instructors and researchers, and a wage that matches the rhetoric of value that the administration has spoken of. As the summer term begins, we at RAFO will reach out to those of you who are teaching, to make sure you are getting the support you need and find out what you still need. We are also asking all RAFO members to stay in touch with the leadership as negotiations continue. Those who want to stay informed should like RAFO’s Facebook page (https://www.facebook.com/RAFO1920/) and Twitter feed (@RAFO1920) for news about Roosevelt as well as other issues of interest to those of us concerned with adjuncts and higher education. I’ve taught off and on (more off, lately) at Roosevelt since the fall of 1997 – nearly twenty years now. During that time I’ve taught Business Ethics, Technology and Human Values, Logic, Existentialism, and World Religions. 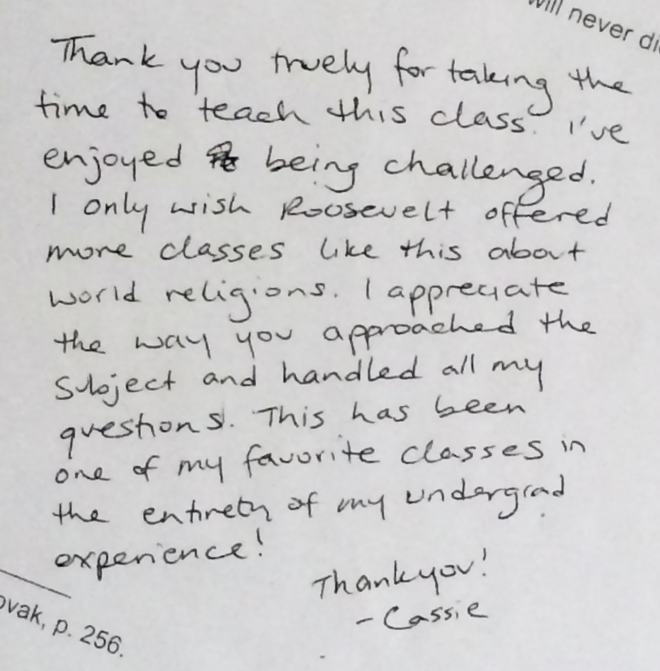 One of my students from the World Religions class I taught during the fall 2013 term wrote me a very kind and generous thank you note (written on the back of her 100 question multiple choice final exam). And when she wrote, “I’ve enjoyed being challenged,” she struck gold in this old curmudgeon’s heart. The name of the game in higher education is retention, retention, retention. One of any college’s most intensive (and expensive) tasks is courting its first year students, persuading them to stay on and earn their degree from Alma Mater U. (and, hopefully, become future Alma Mater donors). To retain students, many colleges sell the college “experience” at the expense of the college education. For those being courted, faculties need to keep rigorous expectations to a minimum. Adjuncts (more than full time faculty) face being gored on the horns of this dilemma: do you expect less of your students (and that’s ok)? Or do you set the bar high for them (but risk getting fired)? Luckily, this dilemma has a marvelous corollary: Do you teach to live? Or do you live to teach? Let’s call it the passion corollary. If you teach to live, teaching is not your passion. If you live to teach, that is, if you know that your life would be less enjoyable, less challenging, more boring, and more mundane if you cannot teach, then I have some very bad news – you, my friend, are a teacher. No one gets from the old to the new without doing some heavy duty stretching. When you don’t challenge your students, you let them down – because you don’t think they can do it. I always love the line from Robert Browning: “Ah, but a man's reach should exceed his grasp / Or what's a heaven for?” ("Andrea del Sarto", line 98). Exactly. I was honored to serve as the lone RAFO delegate to the Illinois Education Association Representative Assembly held in Chicago from March 30th through April 1st. First, a shoutout to my friend and RAFO colleague Bonnie Smothers. Bonnie actually received more membership votes than I did to serve as delegate, but she was unable to attend and I had the opportunity to serve as her successor. The 3-day Assembly was energized with almost 1,000 educators, support staff, and retired IEA members statewide. During the first morning of the Conference, we were starkly reminded by the IEA staff attorney and by the IEA staff lobbyist of the existential threats that we as educators face, both from Springfield and from Washington. Higher Ed in particular is under attack, as potential legislation and court decisions threaten our right to organize for the purpose of collective bargaining. Fortunately for RAFO members, our own Beverly Stewart, one of my mentors and a tireless advocate for Higher Ed, is the head of the Higher Education section of the IEA. The Higher Ed section (about 40-45 of us) had a productive and inspiring working lunch session, in which Beverly outlined some of the ways in which we can become more active, involved, and vocal advocates on political issues relating to Higher Ed. Some of the Conference was devoted to administrative issues, like the election of directors, and of new officers, including President. IEA's president-elect, Kathy Griffin, like her predecessor Cinda Klickna, is a true and loyal friend of and advocate for issues unique to Higher Ed. She has often "rolled up her sleeves" and marched alongside Higher Ed advocates, and we know that she will "have our backs" during her term as President. The administrative issue voted on at the Conference that will have the most direct impact on us, is the difficult decision to raise membership dues $5 per year this coming fiscal year, and an additional $10 the following year. There was spirited and emotional debate on this budgetary issue, which also included substantial staff and other administrative cuts. In the end, the majority of delegates agreed that the increases were necessary to fund advocacy campaigns, and to fund the pension system. With the financial interests of adjuncts at heart, Beverly proposed several successfully-passed resolutions that directed the IEA Board to consider a "tiered" dues structure based upon income, which would provide relief to our many contingent faculty members who may only teach 1-2 classes per year at Roosevelt (if that), for whom the burden of union dues hits the hardest. It is crucial that we RAFO members have unconditional support from our "parent" organization. I came away from the Conference confident that we do. In my own mind, and I hope in yours, we are getting a very tangible "bang for our buck" by the dues we pay to the IEA. We urge you become more active with RAFO. Michael W. Pinsof, Adjunct Instructor, Paralegal Studies Dept.